Casino Supply has been manufacturing professional quality roulette layouts / roulette felts for years. Our high quality layouts are used in several major casinos across the globe. 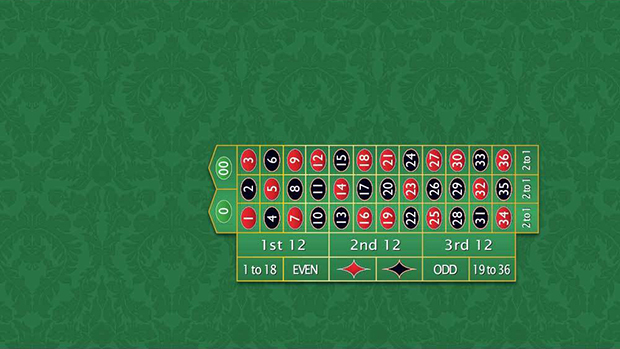 Our stock green roulette layout design features all standard betting areas and a traditional American 0/00 design or European 0 design. We also offer both Right Hand and Left Hand layouts. We can quickly and affordably print custom roulette layouts to meet any needs. Our digital printing equipment is capable of producing thousands of beautiful colors and exciting game designs. Let our professional layout design staff work with you to create an amazing gaming layout that is truly one of a kind. Typical delivery time for custom layouts is two weeks. Rush processing is available, although extra charges may apply. Professional casino layouts are only the fabric that covers the game table.